On April 9, the Political Congress of the Central Committee of the Workers 'Party of Korea was held under the leadership of Kim JongEun , chairman of the Workers' Party of Korea, chairman of the DPRK National Committee, and leader of the party, the nation and the military . Members of the Standing Committee of the Political Bureau of the Central Committee of the Workers' Party of the DPRK , members of the Politburo of the Central Committee of the Party, and the committee members participated. The Cabinet Deputy Prime Ministers also participated in the rally. According to the delegation of the Central Committee Political Bureau of the party, the supreme leaderKim Jong Eun dignified his society. The Political Congress of the Central Committee of the Workers' Party of the DPRC discussed the "State Budget Implementation Formulation of Juche 106 (2017) and the State Budget for Juche 107 (2018)" to be submitted to the Sixth Session of the 13th Session of the Supreme People's Assembly. The report was made by Park Bong-joo, a member of the Central Committee Political Bureau Standing Committee and Prime Minister of the Party. The Political Bureau of the Central Committee of the Workers' Party of the DPRK unanimously adopted a decision to review and ratify the national budget for the next year and submit it to the Sixth Session of the 13th Session of the Supreme People's Assembly. 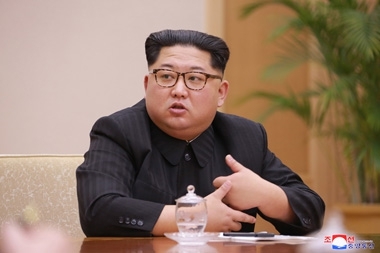 In the political council of the Central Committee of the Workers' Party of Korea , there was a report of a dignifiedleader of the Leader Comrade on the recent development of the Korean Peninsula . The delegation of the Supreme Leader said , "We will deeply analyze and evaluate the North-South relationship development direction and the prospect of seasonal dialogue in the near future by referring to the North-South summit meeting and the meeting held in the" House of Peace " And tactical issues that our party will pursue, including directions for action. The delegation of the Supreme Leader of the Grand National Party pointed out the recent business situation of the members of the Political Bureau of the Central Committee of the Party and emphasized the importance of exerting more responsibility and role as the commander of the revolution. We will continue to hold the revolutionary banner of self-regeneration in all sectors of our country, all units, and carry out this year's struggle, the third year of national economic development 5-year strategy, He talked about what he said by opening breakthroughs in the overall economy.